If Metroidvania can be the genre mash-up of Metroid and Castlevania games, and rouge-like or rogue-lite can be a genre, then I propose adding Picross-like to the list as a genre-defining any puzzle game that takes strong cues from the original black and white puzzle game Picross. Piczle Colors from Score Studios, is a homage and upgrade in some ways to the Picross style of puzzles where you uncover a pixel bit image by solving rows and columns of numbers using logic. Score Studios Frog is becoming a staple developer on the Switch with three Piczle puzzle titles currently available on the Nintendo Switch. Their puzzle series in the Piczle gaming universe once again bring together Professor Matrix, Score-Chan and D-Bug. 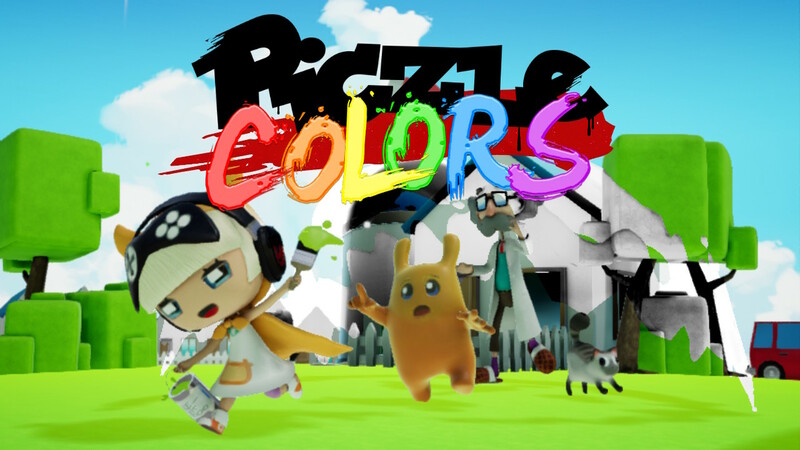 The Piczle Lines and Color games don’t really have a story narrative, as most puzzle games omit this portion of video games to cut straight to the puzzling games within, but Piczle Colors, and previously released Piczle Lines games do try to add some character through its zany characters and their unique design and art style. These characters carry throughout the Piczle Colors game with some of them showing up as solvable images in the mainline puzzles, while others popping in as encouragement when you achieve a certain number of puzzles solved. If you clear puzzles without using hints you can earn coins which unlock in-game features, such as trophies and a 3D model viewer. The puzzles are broken up into color palettes: red, orange, yellow, green, blue, and purple, each with their own 50 puzzles. These puzzles consist of 5×5, 10×5, 10×10, 15×10 configurations. The main difference in Piczle Colors vs. similar colored Picross games like Pic-a-Pix Pieces for instance, is the way in which you interpret and solve the puzzle themselves. Whereas Pic-a-Pix Pieces told you the order left to right, or top to bottom, in which the colors would fill the puzzle, and you had to use deduction to fill in the spaces. Piczle Colors changes things up by adding a color background swatch to a number which references then the number of colors in the row that would be side-by-side. Or there is simply a number without a background which then means that color would be split up within its column or row. I found the logical side of my brain having to work a bit differently as I colored each space. Which is another difference in Piczle Colors over Pic-a-Pix Pieces, which used white to denote non-olored spaces. In Piczle Colors white is an actual paint can color and number that would appear in the color or row with which then you’d have to solve for. The colored puzzles are still very simple. And since you are dealing with a max size of 20 boxes (or pixels) the puzzles themselves are also very small. There were times where the item was reflected either horizontally or vertically, which meant solving the puzzle faster. For the most part, each puzzle was unique and challenging enough to make me scratch my head a few times throughout. In the early levels through the 5×5 puzzles could usually be filled in within a minute. Each time you complete a puzzle you are shown your time as well as the best time. Piczle Colors can be played using either touch controls, which allows you to select your paint can and place paint within the puzzles boxes. Or you can use traditional controls via joy con or pro controller in docked mode. Which the traditional controls work, I found the speed and precision in the touch controls to me my preferred method. The game ‘unofficially’ supports multiplayer. What I mean by that is that while playing the game for review I also played it in ‘bed more’ laying the Switch down and allowing my daughters and I to select colors and solve the puzzle together. While it can be harder to solve a puzzle if everyone’s fingers and hands are covering the screen, it was a fun way to play the game together and would recommend it to a parent or siblings, so long as you can communicate and agree on solving the puzzles together. Piczle Colors has a great style presentation that includes characters, which I mentioned before. Along with those characters, there are some 3D objects which you can unlock by completing puzzles in certain time frames. This challenge to get all the objects presses the gamer to get faster at finding the row or column that will lead to the domino effect of being able to solve the puzzle. When you get that ‘aha’ moment, the satisfaction of completing a puzzle is very rewarding. If we are going to continue down the route of comparison, Piczle Colors completely wins in the music and audio department. The music is so much more diverse and soothing in Piczle Colors and one of the best parts of playing this game, especially with the sound on. Pic-a-Pix Pieces only had one boring bit of background music that it played over and over again. Piczle Colors has a mix of jazz and techno beats that it mixes into the music. Some of the audio sounds, like the puzzle completion music, felt like it fit within the world of Nintendo’s own Splatoon series. Puzzle games have a definitive end. And that end comes when the puzzles are all completed and satisfactory completion scores are met by the gamer. As it is right now Piczle Colors has 300 puzzles. Even at a minute a puzzle, which is more like 3-4 on average when you factor in the larger 15×10 puzzles, the time spent with Piczle Colors is a great diversionary game. The puzzle artwork is simple and the logic needed to complete each puzzle is just enough to be challenging to even seasoned veterans. Piczle Colors is a well-rounded ‘picross-like’ in the puzzle genre and will please anyone who is a puzzle fan.